Helped NN24 gain strategic clarity, understand the needs and values of its target audience, and develop a plan for creating desirable, relevant content. This included extensive stakeholder interviews, an organizational assessment, external landscape analysis, in-depth user research, and prototyping process. NN24 is a Nigerian television network that launched in May 2010. The company billed itself as the country’s first 24-hour station, broadcasting news around the globe from an African perspective. Nigerians both living in the country and abroad praised the network for its modern, high-quality, objective take on reporting — a new model for broadcast journalism in Nigeria. With an affiliate partnership with CNN International, multi-year advertising deal with Mediacom, seasoned African producers, and rave reviews for their hosting of early presidential debates, NN24 seemed on the cusp of something transformational. However, after a year on air, the network was struggling. Despite having passionate leadership, a strong vision, and well-trained staff, NN24’s viewership was declining. I worked with the Lagos-based company in 2011 to help it gain strategic clarity, understand the needs and values of its target audience, and develop a plan for continuing to create desirable, relevant content. Nearly two years prior to NN24’s launch, the founding team had hired a consultant to create a high-level product and marketing strategy to share with potential investors. 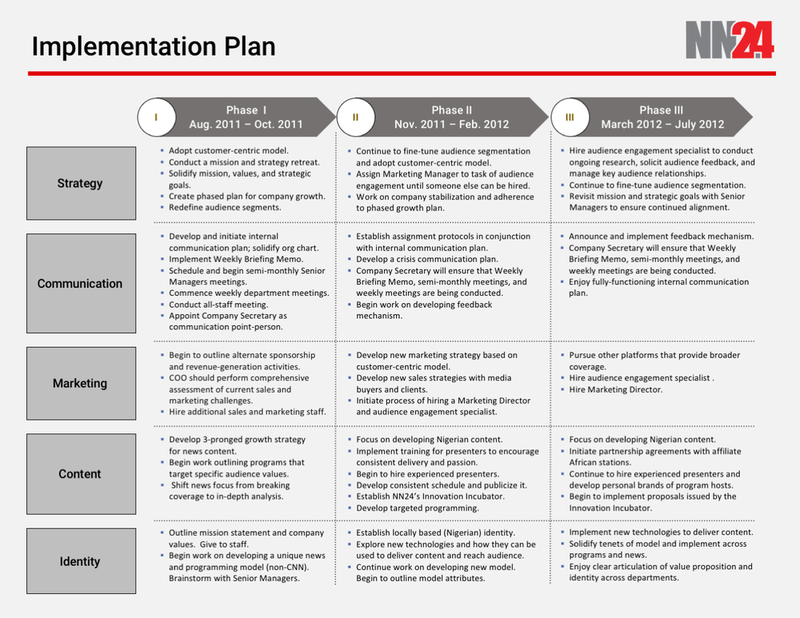 However, this strategy lacked a clear picture of NN24’s target audience or value proposition. Without any research on the needs, values, motivations, and frustrations of potential viewers, NN24 had developed a content first, audience second model. The network had adopted a brand shorthand — the “CNN of Africa” — assuming this resonated with Nigerian viewers both locally and across the diaspora. Yet given declining viewership, low advertising revenue, and a growing sense of discontent among original fans, this assumption seemed tenuous at best. NN24 would need to dig deeper, anchoring its content strategy and brand on real user needs. Because I had just three months to complete this consulting project, I had to move quickly. I spent my first two weeks in Lagos meeting with members of NN24’s executive team to better understand the company’s situation and to define the parameters of my work. Through these conversations and an initial SWOT analysis, it became clear that NN24 would need to rethink its strategy to develop a more operationally feasible and economically viable business model. For starters, the team would need to address pressing internal issues, such as staff alignment, and gain a better understanding of the priorities and perceptions of critical value chain partners, such as advertisers and media professionals. Yet, even with a leaner operating structure and stronger partnerships, NN24 would be unable to realize its vision if it couldn’t produce desirable programming. 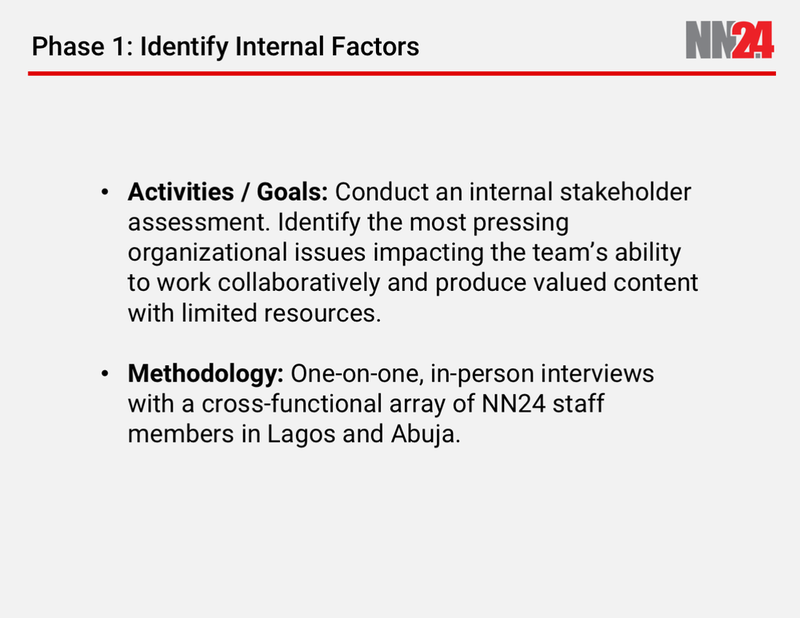 Based on this assessment, I drafted a project proposal focused on the following objective: How can NN24 create relevant, high-impact content for a global Nigerian audience? I broke my work into five phases: 1) Identify internal factors, 2) Gather external perspectives, 3) Understand audience needs, 4) Synthesize findings, and 5) Develop solutions (see images below). Before starting Phase 1 of my research, I led a two-day project kick-off with a group of key staff members. I led the group in a brainstorming activity to identify the network’s most promising audience segments, and explored ways in which the team might support my research. I not only aimed to surface company-wide knowledge and gather initial perspectives on NN24’s brand and content, but also to build interest and excitement in the work, identify project champions, and set a tone of transparency and trust. Given the company’s day-to-day challenges — regional power outages, cut-backs on content, and limited financial resources — employee morale was low. I wanted to present myself as an ally, establish shared values, and pave the way for a collaborative process. In conducting an internal assessment, I interviewed 36 staff members across all departments in the Lagos and Abuja bureaus. I aimed to identify the most pressing organizational issues, get a sense for relative staff alignment on values and vision, and build empathy for the team I’d be working with. Given the sensitive nature of my questions, I held private, one-on-one conversations and spent the first 30 minutes of each interaction just getting to know staff. I allowed the conversations to progress naturally, listening more than speaking, avoiding leading questions, using analogies to stimulate thought, and phrasing questions in an open-ended way. While some employees felt empowered to speak candidly, eager to share concerns, I could tell that others remained guarded, perhaps uncertain about my intentions and how information might be used against them. I made a note to to be conscious of this issue moving forward. After I had completed all internal interviews, I reviewed my notes and grouped feedback into three categories: 1) Company strengths, 2) Company weaknesses, and 3) Tensions and areas of misalignment. From there, I pulled out the most compelling themes. 1) Company strengths: The staff expressed a strong commitment to NN24’s original mission, and in general, felt as if they had helped build a groundbreaking company. Several employees mentioned that they would be reluctant to leave despite the company’s uncertain future, because of their belief in NN24’s potential. Interviewees spoke passionately about the nation’s need for a high-quality news network, viewing NN24 as a democratizing force in Nigeria. 2) Company weaknesses: While the staff voiced a range of financial and operational concerns, it was clear these hadn’t stopped them from pushing forward. I was amazed by the level of resilience and resourcefulness that I saw at the station, including one week where the entire Lagos bureau had been flooded during a storm because of poor infrastructure. While accounting ledgers and cameras literally floated by in the hallways, the team scrambled to salvage equipment, assemble a makeshift newsroom, and get back on air. This was definitely a team that could deal with resource constraints. The more pressing issue in this case seemed to be poor internal communication. As one employee stated, “We’re a communications outfit, but we’re not communicating.” The staff shared their thoughts on key contributing factors, such as limited visibility into executive decision-making, siloed departments, and the lack of internal communication processes. 3) Tensions and areas of misalignment: Since NN24’s launch, the company had struggled to maintain stability and focus while enduring financial struggles, going off air because of power outages and funding issues, losing and gaining new managers, restructuring, and adopting new creative visions — all while being under intense public scrutiny. It became clear during my conversations that this instability had taken a toll on internal alignment. As a result, interviewees expressed conflicting views about content quality, brand identity, and target audience. For the next phase, I gathered information on Nigeria’s television broadcast industry, sought external perspectives on NN24’s market position, and identified structural and strategic barriers to NN24’s success. I interviewed a range of value chain partners, including media planning and buying agencies, e-commerce and advertising firms, Nigeria’s National Broadcasting Commission, and media consultants. Interviewees were not shy about sharing candid thoughts on NN24’s current state. Across the board, interviewees voiced concern over NN24’s lack of a well-developed value proposition. They stressed the need for an in-depth understanding of audience tastes, values, and desires in order to create a successful content strategy and attract viewers. They warned that, though more and more Nigerians were getting digital TV, this would not solve NN24’s audience reach problem, as access was limited to DStv subscribers. NN24 would need to think strategically about ways to broaden its exposure. Interviewees additionally offered specific content, brand, and operational recommendations that could help with differentiation. They suggested that NN24 rethink its “CNN of Africa” model to create a new paradigm, focus on in-depth analysis over breaking news coverage, and develop a distinct Nigerian identity before pursuing pan-African or international markets. Finally, interviews with media buying agencies revealed concerns around NN24’s ability to generate advertising revenue. Media buyers in Nigeria rely on data from two subscription services to understand network segmentation and direct purchasing decisions. Without adequate viewership numbers as reported by these services, a network like NN24 would have little chance of selling ad space to conventional buyers. For this phase of the engagement, I conducted user research to better understand the needs, desires, pain points, and aspirations of NN24’s target viewers. I believed that a human-centered design approach could shift NN24 away from a content first, audience second model, and toward a strategy where user needs and values determined creative decisions. I focused my research on six audience segments, as identified during the project kick-off. In order to surface both high-level themes and in-depth insights, I used four methods to collect a range of qualitative and quantitative data: focus groups, individual interviews, observations, and an online survey. What do target viewers value and why? How does that affect what they watch? What frustrates them and why? How does that affect what they watch? What are their news-watching habits? When, how, and with whom do they watch news? What do they think is missing from international and Nigerian news offerings? What content, programming, and delivery options do they desire? What are their opinions about NN24 as it currently exists? I kicked off my user research with six focus groups — one for each of the audience segments. Rather than searching for definitive answers, I hoped to gather high-level feedback and identify broad themes quickly. I could then sketch out audience personas, adding depth and testing assumptions through other methods such as interviews and observations. To find appropriate participants, I posted the opportunity on several social media channels, academic and professional group listservs, and public message boards in Lagos. I then screened prospective participants to ensure a diverse mix of perspectives within each segment while accounting for class, gender, and income differences that could affect group dynamics. I ultimately selected 6 - 10 participants for each group. To prepare for the sessions and ensure I’d be able to address my research objectives, I developed a semi-structured moderator script. I allowed for some flexibility in order to make space for spontaneous reactions, valuable digressions, and moments of synthesis. I filmed each 90-minute session and invited an observer to take detailed notes. During the sessions, I kept the tone informal and friendly, encouraged interaction between participants, and guided the conservation to avoid having any one individual dominate the group. Given the inherent challenges with this research method — the inclination towards group think, the potential inaccuracy of subjects’ memories, the gap between what people say and what they do — I varied the format with questions, association activities, and video clips. While not a perfect proxy for in-context behavior, the video clips allowed for me to observe real-time reactions to news content. I jotted down important quotes, points of contention, body language, and quick insights, and summarized takeaways for participants. Already, I was beginning to see some interesting themes emerge. To complement my focus group research and gain a more nuanced understanding of user needs and pain points around television news, I conducted one-on-one conversations with individuals from each segment. Again, I identified interviewees via social media and relevant listservs, as well as through my professional network in Nigeria. During the conversations, I made sure to ask open-ended questions, listen carefully, and capture emotional and physical cues, as well as verbal ones. This method proved especially useful when speaking with government officials and policy makers, who were more likely to share candid thoughts when interviewed privately. Not only did this research help me pressure-test initial findings and dive much deeper into the values, behaviors, and emotions of target viewers, but it also gave me a greater appreciation for the social and cultural importance of news in Nigeria. I began to piece together a broader desire for access to honest, objective information in a country known for its corruption and lack of transparency. Additionally, interviewees voiced the power of television news to counter this reputation, simultaneously defining a new Nigerian identity while sharing it with a global audience. During this time, I also conducted in-context observations by watching nighttime news at the homes of friends, colleagues, and interviewees. Here, I hoped to get beyond words to observe actions. These sessions were an invaluable source of information and surprise. I watched self-proclaimed “news addicts” flip back and forth between CNN, Al Jazeera, and BBC, despite having sworn allegiance to a single station. I felt the frustration of secondary-school teachers looking for breaking news about local strikes, only to give up. I noticed that trendsetters, urban professionals, and students alike tuned in to Channels’ 10:00 pm nightly briefing, switching over from Galaxy or Africa Magic for this evening ritual. And I laughed with elected officials about over-the-top depictions of the latest political scandals. Each observation not only revealed new behaviors and put my assumptions to the test, but also helped me build empathy for viewers’ emotional needs and frustrations. Finally, I gathered quantitative and qualitative feedback in an online audience survey, which I created using Qualtrics. I aimed to help NN24 understand the defining attributes and habits of current viewers, and shed light on any differences between existing and target audience segments. I included questions on demographics, digital accessibility, competitors, content and scheduling preferences, NN24’s value proposition, and brand affinity. In order to limit selection and response bias, I included a short section to screen out inappropriate candidates and thought carefully about flow and survey design. I shared the survey with a broad range of individuals, including NN24 staff (although staff were not permitted to complete the survey), my own academic and professional networks in Nigeria, focus group participants and interviewees, and media partners. These individuals were then encouraged to forward the link on to friends, colleagues, and family. Additionally, NN24 advertised the survey on social media and created an on-air filler. After screening out irrelevant data, I counted 262 responses. In organizing the data, I used descriptive statistics, t-tests, and ANOVAs to identify user preferences and segment-level differences. Additionally, I performed qualitative analyses via inductive comment coding to surface underlying motivations, values, and frustrations. To synthesize my user research and identify opportunities for innovation, I first reviewed all notes, video footage, and survey coding, organizing information by individual segments. I jotted down important quotes, memorable observations, pain points, and bold ideas onto Post-it notes and then visually organized these into themes. Next, I looked for patterns, commonalities, discrepancies, and relationships across segments to pull out higher-level insights. I regrouped Post-its into several compelling categories: realness and relevance, captivating presenters, in-depth coverage beyond breaking news, and online content. At an even higher level, these Post-its could be clustered into three core themes: authenticity, quality, and access. Realness and relevance: The most striking theme that emerged from the user research was a near universal desire for “realness” and cultural relevance. Across all segments, individuals voiced a need for an African perspective on African issues. Not only did research participants long for innovative content, including richer local and Pan-African news, but they also craved an innovative presentation style and format that would resonate with Nigerian values. Viewers encouraged NN24 to embrace a complex representation of contemporary Nigerians. On the one hand, viewers rejected outdated stereotypes of “tradition.” On the other hand, this audience was turned off by Westernized versions of “modernity.” Here was an opportunity to create a new model of television news which was relevant to the times and distinctly Nigerian. Captivating presenters: Related to the value of “realness,” research participants also voiced a strong need for presenters who exhibit passion and charisma. Nigerians in the diaspora stated that reporters should be authentic, intelligent, and able to form a deep connection with viewers. Members of this segment encouraged NN24 to rethink its approach, and pointed to Wazobia FM as a successful model with charismatic personalities capable of delivering in-depth analysis. Similarly, students looked for presenters who are passionate, inquisitive, and skilled. They stated that not only do anchors need to “talk well, look alive, and enjoy what they do,” but they also need to engage their viewers on a more emotional level. In-depth, quality coverage: Another key theme that surfaced was a desire for in-depth, high-quality news. Disappointed with the caliber of local offerings, research participants expressed a need for consistent quality standards, issue-level expertise, and hard-hitting investigations. Individuals warned that costly sets and elaborate production would only get a network so far, and appeared fed up with the artifice. Rather, stations should pursue sustained viewership by tackling local and national content in a new way: explore topics with rigor, present multiple perspectives, and provide in-depth analysis. Think beyond “breaking news”: Additionally, participants voiced concerns about tradeoffs between quality and quantity given the fixation on providing 24/7 coverage. With constant access to information via online, mobile, and international television channels, individuals today have the capacity to be their own news aggregators and broadcasters. Participants across segments noted that they turn to online sources for breaking news coverage, and have less faith in television news’ capacity to deliver up-to-the-minute information. While this could mean an opportunity for NN24 to be the first national network to provide consistent, on-the-ground, live coverage, it would come at a cost. Given NN24’s significant resource constraints, the company would not be able to offer this type of capital-intensive programming; at least not on television. Participants encouraged NN24 to focus on producing valuable content first, even if that would mean cutting hours on-air. NN24 would need to think beyond breaking news -- a pillar of the “CNN of Africa” model -- in defining its value proposition. Pursue online content: While NN24 would benefit from focusing on quality over 24/7 programming, the company could also consider exploring an online content model. Urban professionals expressed a desire for greater access to information when they want it and how they want it. Similarly, busy finance sector professionals expressed a need to access local news on the fly, rather than wait for specific broadcasts at inconvenient times. Trendsetters indicated that local stations were not utilizing online platforms effectively. If NN24 could do this, the network would not only gain a wider audience and credibility with young professionals, but it would also differentiate itself from the pack. Additionally, this would allow the network to provide high-quality coverage with faster turnaround times and lower overhead costs. For the final phase of this engagement, I worked with staff to generate ideas and prototype solutions. First, I shared my process and insights with a cross-functional team of department leads. Together, we discussed opportunities and developed personas based on a rethinking of target audience segments. Next, I brought the newsroom staff together for a multi-day design-thinking lab, whereby we took the three core research themes of authenticity, quality, and access and used this as a starting point to develop and prototype content ideas. I introduced the design challenge by sharing salient parts of my research, including quotes, observations, and video clips, and provided lab participants with the newly-created personas. Next, we broke into small groups to brainstorm ideas that would directly address user needs, desires, and pain points. After clustering Post-it notes and identifying the most promising ideas, the group designed prototypes of potential content. These included paper mockups, videos, and skits. Finally, each small team presented its prototype, and the full group identified next steps to test ideas with members of NN24’s target audience. As the final step of this project, I wrote a comprehensive report about my research and insights for NN24’s leadership team. I made specific recommendations on strategy, content, brand, marketing, and internal communication, stressing the need for an audience-centered approach. I additionally provided the team with an implementation plan to help them get on track for the changes ahead. While charting a new course wouldn’t be easy, I felt confident that the team had the passion and skills needed to succeed. If given more time, I would have led testing on the team’s prototypes, further refined NN24’s content strategy, and aligned the company’s business model with the new strategic vision. I also would have conducted more research on news-focused radio stations in Nigeria, as several interviewees pointed to radio as a dynamic, high-quality alternative to television.